A longtime advocate for women’s voices, Barbara Field is a mentor for the Afghan Women’s Writing Project. The words flashed on Barbara Field’s screen and moved her deeply. She had been working with an Afghan woman named Mahnaz on an essay about the definition of a beautiful woman and was hoping to get it published soon. Field, who manages communications and metrics for the Office of the Controller in Business and Financial Services, volunteers as a mentor for the Afghan Women’s Writing Project in her spare time. After exchanging many e-mails with the woman and giving her feedback, the piece was published on the project’s website, where it received many positive comments from readers. Field decided to become a mentor for the project after following news coverage of the war in Afghanistan and realizing how muffled women’s voices were in that country. “I can feel my life is changing because of my interactions with these women,” Field said. The Afghan Women’s Writing Project aims to give women in the war-torn country a voice and empower them to change their lives, said Rachel de Baere, director of the project. “We feel that it is a human right to tell one’s story,” she said. So far, 50 mentors are working with about 60 women. They come from all walks of life, though all of them know English. One woman who began writing for the project decided to run for parliament—and won. Another refused to marry someone her family had chosen for her. Many conceal their writings from their family. One woman moves the laptop the project gave her from hiding spot to hiding spot every night. One night, she hid it in a woodpile under the kitchen stove. 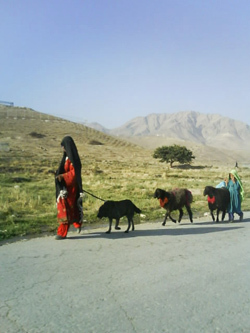 Another woman walks for four hours to Kabul to get Internet access and file her pieces. She is escorted by her little brother, the only family member who knows about her writing. The project has recently opened a “women’s writing hut,” Afghanistan’s first women-only Internet café at an undisclosed location, de Baere said. The café offers laptop, Internet access—and community. A project team member hosts workshops and meetings, which allow the women to share their writing. She started out as a mentor for the project in January 2010. “Every day that I received something [from these women], I felt like crying,” she said. It’s a feeling Field knows well. 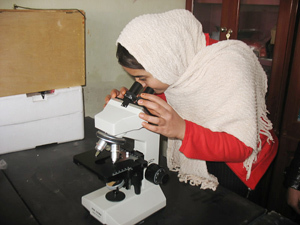 In addition to Mahnaz, the author of the beautiful woman essay, Field works with Pakiza, another highly educated woman, who decided to write about how life is changing for the better for women in Afghanistan. Field said she hopes she’ll be able to mentor the youngest writer in her group, who is only 14. Both she and de Baere said they encourage everyone to visit the project’s website and comment on the pieces. Donations are always welcome too, Field said. Writing has long been her passion. Before coming to UC San Diego, Field was on staff at CBS, Harcourt Brace Publishing and The Scripps Research Institute. She published in newspapers, magazines and online. Her novel, “The Deeper, The Bluer,” won a Writer’s Digest fiction award. She also teaches at UCSD Extension. 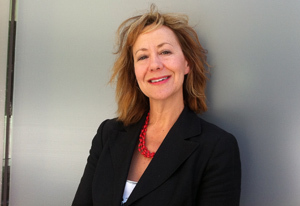 A longtime advocate for women’s voices, she recently brought the Op-Ed Project to UCSD. That initiative pairs women writers with mentors and guides them through publication of opinion pieces in major news outlets. Volunteering for the Afghan Women’s Writing Project has been one of the highlights of her writing life, Field said.